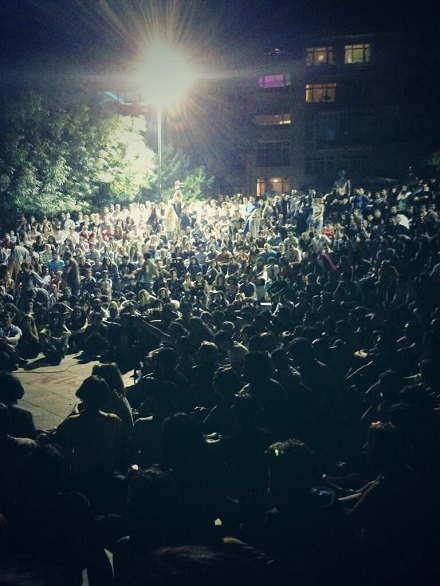 Since Monday 17th June, starting with Abbasağa Park in Beşiktaş, popular public assemblies (forums) have been cropping up where people get together, listen to each other, talk on what the next step should be, share with each other first hand accounts etc. The forums serve a multitude of functions. For starters it is the most direct form of democracy since everyone has a voice. Second, it is a good way to coordinate the resistance whilst there is an ongoing witch hunt for ‘terrorists’. Third, it is a signal to the government that certain segments do not feel represented. Initially every speaker was allowed 2 minutes to speak but the length has been extended. People don’t tend to allow others to hijack the stage, waste time or to ramble on. At first, there weren’t microphones but sometimes megaphones were used at low decibels. Now because the crowds have grown, I know for one the Kadıköy Forum is using mics. The general point though is to keep the noise to a minimum since the parks are in residential neighborhoods. Borrowed from the indignados movement, certain hand gestures are used to communicate. Wave of the hand upright is for ‘silent agreement’, arms raised and crossed is ‘i disagree’. Another motion is for “you’re wasting time, cut to the chase”. The discussions have been changing over the days as well. Initially the meetings were a bit cocophonic where people mostly vented their frustrations and personal experiences over the past weeks. Now the discussions are more useful in the sense that people are sharing good advice in whichever way relates to their experiences. For example, lawyers inform the public on citizen’s rights, what the police can and can’t do and how you should respond. There has also been a shift towards discussions on what the next step should be. Volunteers are signed up after each session on plans that have been voted on that evening. For example, the main rally right now is to lobby, promote, put pressure on, create information networks in order to free protesters that are being taken in on anti-terror laws in relation to the protests. Just as importantly, the forums create the medium for people to listen to and understand each other. This also goes for those who are opposed to the resistance movement or even the undercover policemen. Many speakers refer to the importance of refraining from an ‘us and them’ rhetoric or belittling attitudes against the ‘50%’ who voted AKP. The aim is to expand the discussion to all segments of society and to hear all voices. Having said this, I am still not sure whether it is possible for the forums to function both as an organisational base for the resistance and to also be a place where politically oppositional segments of society have a discussion. In summary, over the last 5 days, the number of forums – and cities they are held in – have been increasing. Since Istanbul has by far the largest population in Turkey, not to mention it has been the epicentre of the protests most of the time, the number of forums are much higher in number. 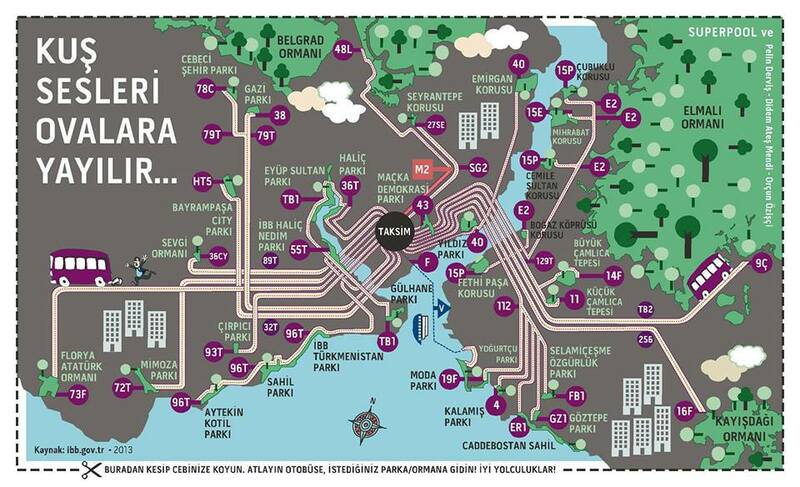 Tonight Istanbul will host 38 forums going on simultaneously in parks across the city. Ankara will be hosting 13, and İzmir 4. Antalya, Eskişehir, Kocaeli, Edirne, Adana, Samsun, Bursa, Sakarya and Muğla will also congregate in parks for their own experience in direct democracy. What makes this move brilliant is not the unyielding attitude in the face of forced relocation, or the fervour of the protesters to keep the fire of the movement alight, but the way in which public assemblies and discussions in parks are trying out new (or very old depending on the way you look at it) methods in direct democracy to express their will. After all, although the government is still insistent on treating the protest as an isolated environmentalist issues, the real grievance of the masses in the streets is the increasing encroachment of the state on people’s individual freedoms, its preferential treatment of whole communities (minorities), the weakness of checks and balances that regulate the independence of the government and the courts, the lack of rule of law etc and the way all of the mentioned and so many more examples have a day-to-day impact on people’s lives. In summary, the bone of contention is with an authoritarian government with a strong electoral base which sees its ‘50%’ support as a ‘green light’ to impose its own social program. Not surprisingly, one side effect of this distorted view of democracy is a disenchantment with its representative model. The definition of the term democracy and its contents – whether it is an ideal or a form of government- are undoubtably questionable. However, it is easier to highlight the discrepancy between the AKP’s democracy rhetoric – through written texts like the party program, election campaign texts, conferences sponsored by the AKP on ‘conservative democracy’ (!!) – and undemocratic and/or illiberal case studies. Highlighting this discrepancy is an entirely different article which I will not get into here. Nevertheless, the AKP’s shallow use of ‘democratisation’ as an umbrella term has served the purpose of not only devaluing its meaning, but also in exacerbating the crisis of representative democracy even further.